Smile-A-Mile has benefited us as a family in so many ways. Taylor (pictured left) was diagnosed with stage 4 neuroblastoma at the age of 20 months. He was an only child and only grandchild and he missed out on a very important time period in his life as far as learning to interact with other children. Being invited to the many activities that SAM offers gave Taylor a chance to interact with children and not just any children, but children that looked like him. 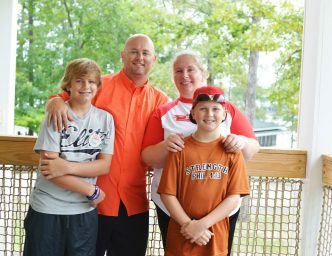 Cancer and treatments take a toll on families and many of the activities such as bowling, the circus, the pumpkin patch, just to name a few, were a fun way to step away and forget for a while. I think the actual camp sessions are the most important. Taylor has attended camp since 2002. He has blossomed into a very social and compassionate child. His confidence is boosted by being able to interact, talk, play and see others who have walked this journey and really understand! Family camp is also important. We, as parents, can discuss our highs and lows with families that understand and don’t judge. I could go on and on, but you get the idea!! We love SAM and everyone involved! !